With a brand new home, the possibilities for landscaping are wide open. There are so many ways to beautify the land that your home was built on. When you have a new home built by custom home builders in NC, your outdoor spaces should be an equally important part of your home design. Consider the latest trends in home landscaping and get some great ideas for your yard. Low Maintenance Plants. With busy lifestyles becoming the norm, many people are looking for low maintenance landscaping that won’t require much upkeep from week to week. Plants that are hearty in dry conditions and won’t need extra watering are popular for convenience and economic reasons. Let landscaping experts recommend plants that work well in the region where you live. Vegetable Gardens on Display. Growing your own veggies is becoming common practice again as organic foods offer health benefits. What’s changing most is that your garden doesn’t have to be in the backyard out of sight. Your veggies can be planted in the front yard among other attractive flowering plants which not only offers aesthetic benefits, but cross pollination benefits as well. Flowing Water. The serenity from moving water makes it a valuable investment. Fountains, fish ponds, waterfalls, and more are popular additions to many yards and patios. Zen gardens are all the rage with water scenes for peaceful meditation. Outdoor Kitchens. This concept is by no means new, but it continues to be a staple for backyard patios. Elaborate grilling and outdoor cooking areas combined with comfortable patio seating, often under and pergola or pavilion, is ideal for outdoor family dining and entertaining. Indoor Comforts Outdoors. Thanks to advances in outdoor furniture design, it’s possible to have indoor-quality furniture outside. Waterproof and fade-proof fabrics, as well as durable materials, make it possible to have stylish, cozy outdoor furniture that holds up to the elements. Stone or Tile Steps and Paths. Direct the flow of traffic in your yard with stones, tiles, or concrete pads. Create pathways and stepping stones to take guests on an adventure through your beautifully landscaped backyard, or lead them right to your front door without damaging the grass. Landscaping does not have to be an afterthought once your home is completed. Your plans for your outdoor spaces and plants should be part of your original home design. 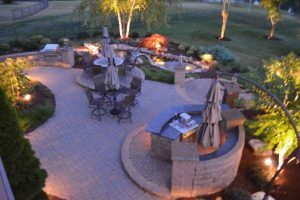 In order to make the best use of the lay of the land, patios, decks, plants, ponds, and other features should be planned for from the beginning. R&K Custom Home Builders in NC have the expertise to incorporate your landscaping ideas into the overall design of your home. From outdoor patios with pergolas to screened-in porches, these spaces are just as important as the home itself. Trust your whole home to R&K Custom Home Builders. To get started planning your dream home today, call (336) 643-3503 to schedule a free consultation.